Submitted by: Madeleine Stones (nee Barrett). Maurice Barrett (my father) is on the far right of the 2nd row. I think there is a Bagley (2nd left on 2nd row). 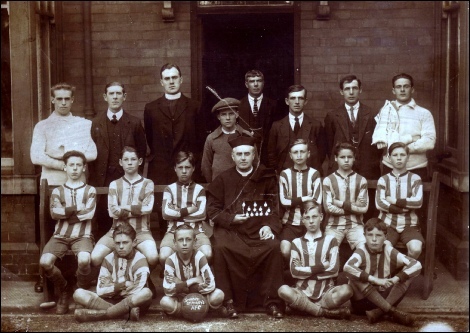 Thomas Barrett (Maurice’s father) is 2nd left on the back row. I would love to know who the rest are. A relation, on looking through the Seaham site, saw the picture and showed it to a work colleague who gave the following information. The priest at the front is the parish priest - Fr. Haggerty. The other priest was the curate - Fr. Dunphy. Middle row, 2nd left is James Bagley. Back row, 3rd right is Billy Cassidy. Boy on the ground with the ball is Jimmy Kelly (from Murton). Hope someone else looks and can be helpful.